Micro-Tek Corp: Custom drawing, stranding and insulating of fine wire and cable. Applications > Application Profiles > Micro-Tek Corp: Custom drawing, stranding and insulating of fine wire and cable. Fine wire and cable made with Teflon® PTFE, FEP, PFA, & Tefzel® ETFE, ECCtreme® ECA. Micro-Tek, of Cinnaminson, New Jersey, specializes in custom drawing, stranding and insulating, cutting and stripping of fine wire and cable .0009” (AWG #50) and larger. Chemours fluoropolymer resins (Teflon® PTFE, FEP, PFA , Tefzel® ETFE and ECCtreme®ECA) are extruded on various nonferrous, ferrous, plated, unplated, thermocouple and alloy wires in single end, concentric, roped and bunched configurations. Extruded walls as thin as .0035” and made with Teflon® PTFE are just one of the precision engineered products. 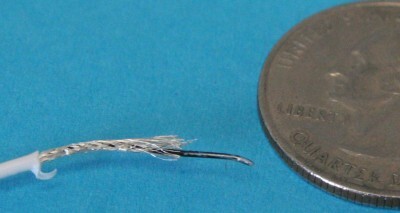 Micro-Tek drew, stranded and annealed silver plated OFHC copper to produce a soft #42/750 (0.0033”) strand. 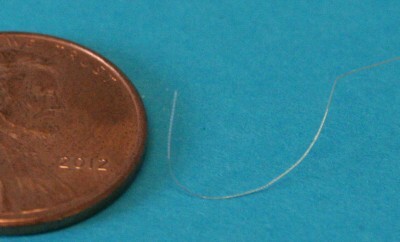 This strand provides a higher flexibility and flex life than a single strand. Using Teflon® PFA fluoropolymer resin, Micro-Tek was able to achieve the customers desired OD. Using extruded PFA allows for a consistent, high quality product in a variety of colors. The PFA insulation’s excellent mechanical, electrical and thermal properties make this insulated strand ideal for a variety of applications and environments with tight dimensional constraints. As a custom manufacturer, Micro-Tek Corp’s operation is designed to accommodate specific customer requirements. One product that demonstrates a broad range of Micro-Tek’s manufacturing capabilities is a 50 Ohm low noise micro-coaxial cable. This product requires stranding the SPC before insulating it with Teflon® PTFE to the specified diameter. A low noise coating is applied to the insulated strand, which is then braided with a (95% coverage) SPC shield. Finally the cable is jacketed with Teflon® FEP to the customer’s required diameter. Please contact us for more information on our product line and manufacturing capabilities.